WPP-owned digital data collection specialist Lightspeed has promoted Andrew Van Wezel to Vice President of Operations and Simon Buckley to Vice President of Sales, both within EMEA. Van Wezel joined the firm in 2005 as a Programmer/Data Analyst, before becoming Research Technology Manager, EMEA, and then Director of Business Process Engineering. More recently, he was the firm's Operations Director, and before this he served as Director, Client Operations - Research Technology and Sampling. In his new role, Van Wezel will lead the region's operational teams. Buckley began his career at Millward Brown, before moving to Kantar Operations in 2004 as an Online Research Consultant, and then to Lightspeed in 2008 as VP - Kantar Client Development. He will now manage Lightspeed's Kantar sales teams across the EMEA region. 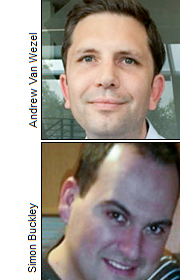 Both now serve as members of the EMEA leadership team, reporting to Caroline Frankum, CEO EMEA, who comments: 'Andrew brings to this new role his years of experience in sampling and research technologies that will enable him to deliver results and innovatively driven operational support. Simon's clear passion and commitment to developing his team, our products and our client servicing reputation and delivery has played a critical role in ensuring that we continue to grow quality-driven client relationships'.